Road trips can be expensive, there's no question about it. Sure, you'll spend less if you camp than if you stay in hotels, but those campsite fees can add up quickly. And when you take into account gas and food, your road trip budget can be blown in a matter of days. Whenever we travel -- either internationally with backpacks or in a campervan around the USA -- we always try to stay on a budget. Watching our spending closely is one of the ways we afford to travel so often and for an extended period of time. We've also learned quite a few road trip budget tricks and hacks along the way that helped us travel cheaply around the US. And as it turns out, you don't need to spend a fortune to have an incredible road trip around the United States, especially when you make your own DIY campervan conversion. So how much does it cost to travel in a campervan in the USA? Are you wondering how much you should budget for your road trip? We're about to break it all down for you in detail so you know how much to budget for the vacation of your dreams. We've laid out everything we spent while living in a campervan this summer... and I mean everything. From gas to toothpaste to a spur-of-the-moment lemonade stand stop, we recorded EVERYTHING. Tip: We use an app called Trail Wallet to keep track of all our spending. Note: This article focuses on our expense during our road trip in our campervan. If you want to know how much it costs to convert a van, check out our DIY campervan conversion. How does this road trip budget work? Alright, let's break it down. We're dissecting exactly what we spent our money on by categories such as transportation, food and entertainment. Plus, we'll share just how much that equates to per day. Our road trip lasted 93 days in total, but we know not everyone can (or wants to!) take a road trip for this long of a time. You can use our budget as a guideline and calculate your expected costs based on how many days your road trip will be. *REMEMBER: All these costs are for TWO people. There are some expenses, like food or drinks, that would be lower if there was only one person. But some expenses, like gas and campground fees would stay the same, no matter how many people. Let's start with the big one first. It wouldn’t be a road trip without transportation expenses. We were stoked to find a 1994 Chevy Van on Craigslist that only had 89,000 miles, and with no other major issues. But the thing with vans that old and large is they typically don't get great gas mileage. We averaged around 15 to 18 miles per gallon, so we knew that this category would be the highest for the summer. In addition to gas, we included public transportation, ferries, street parking, and fixes for a couple mechanical issues. Luckily, we only had one major breakdown and a DIY fix on the van the entire summer. Thankfully, other than the standard oil change, we didn’t have to put too much money into the van. Note: Of course, we purchased for car insurance on our van, but we did not include that cost here for a few reasons. Depending on the driver, the van, your state, driver history, and insurance company, the cost of car insurance will vary. For us, we got a 6-month policy on Vinny the Van through Geico Insurance for around $85 USD. While living in our campervan, we typically cooked most of our meals in our kitchen and occasionally ate at fun restaurants along the way. We tried to limit our eating out in order to save money. Tip: Our favorite grocery store is Trader Joe’s. They always have great quality ingredients and unique food for reasonable prices. We would do a little dance when we saw a “TJ’s” on our Google Map. Oh, and we can't forget about coffee! We kept track of this category more or less because we were curious how much my caffeine addiction was costing us. A little over $100 wasn't too terribly bad for two people in three months. We are not typically the sit-down, tablecloth, “use your dessert spoon”-type of restaurant patrons. Chasing food trucks is also one of our favorite dinnertime activities, especially in cities like Portland and Vancouver. Oh, and we both agree that breakfast is the most underrated meal of the day, so we made sure to have a few fantastic brunches along the way. Trying out new foods and restaurants is one of the best parts of road tripping (or any type of traveling, for that matter!). But in order to save money on this category, we really tried to save eating out for local hot spots, or something totally unique we couldn't get anywhere else. We spent $929.21 on drinks this summer. I know, I know, we were a little surprised when we first saw this number. This includes all beer, wine, liquor and mixers bought at stores, restaurants, breweries, wineries and nights out with friends. For two people for three months of summer fun, it's really not all that terrible. Especially when you consider that's just under $5 per person each day for drinks. But if you really wanted to cut back on something for your summer road trip, this would be it! Let’s just say we had a GREAT summer! On our 3-month campervan road trip around the Western United States we did lots of sightseeing and touring of our own that was completely free. We were fortunate enough to have the America the Beautiful National Park Pass, so we didn't have to pay entry fee into any national parks, which really helped our travel budget ($80 annual pass and totally worth it!). However, we did pay for quite a few state park entrance fees as well as a couple of other activities along the way, which included bucket list items like whale watching in Canada and a guided tour of Antelope Canyon tour in Arizona. In our opinion, the only expense we felt bad about in this category was our gambling losses in Vegas... but it was only $21 so I can’t be too upset. And hey, it's Vegas, so you gotta play a little, right?! All the others were totally worth it. The best thing about having a campervan is that you have your bedroom right behind you and you won’t have to pay for accommodation too often. Since we were on a tight budget and didn’t have a set travel itinerary, we tried to find free places to park the van overnight. And you know what? We found tons of them! We found many campsites where we didn't have to pay, but there were some that required a nightly fee. To give you an idea of how many free places we found, consider this: Out of the 93 days we traveled over the summer, we only paid for 15 nights at campsites. The other nights were spent at free campsites, BLM land, trailheads, parks, a farm, friend’s houses, and two expensive nights in a Las Vegas hotel! This category includes all the odds and ends that didn't fit into the other categories. Things like toiletries, gift for friends and family, batteries, postcards for TWS followers, some new clothes, decor for van, laundromats, and even a lemonade stand (which had waaaaaay too much sugar, but the little girl was too cute to resist). We do a lot of work from the road. Not only do we maintain our blog and create new articles for you guys, but we both have side gigs that keep us busy and bring in cash, and we need Wifi for those jobs. The general rule for us is half-and-half: For every day we are traveling and exploring, we typically have one day for working online. One of the best places to get work done on the road is at local coffee shops. This category is the money we spent on coffee (or beer!) so that we could use the Wifi. If you won't be working during your road trip, you can cut out this category. But if working remotely is part of your life too, this number can hopefully give you an idea of what to expect. And guess what? Many breweries have Wifi too! We would often bring our computers to the brewery and work for a pint or two... But after that, our motivation levels start diminishing fast. Go figure! Tip: Often times when we're at a coffee shop, we'll order one coffee drink to start with, then order the second after an hour or two. This keeps us from drinking all the coffee in the first 20 minutes and having to keep buying new drinks. We had a cooler in our campervan to keep our perishables cold. We would typically buy a bag of ice once every 3 days. This should give you a decent idea of how much to expect to spend keeping your food chilled, especially during hot summer months. There are tons of places you can shower while on the road if you know where to look. Some places cost a few bucks to use a shower, but others were free to get clean. 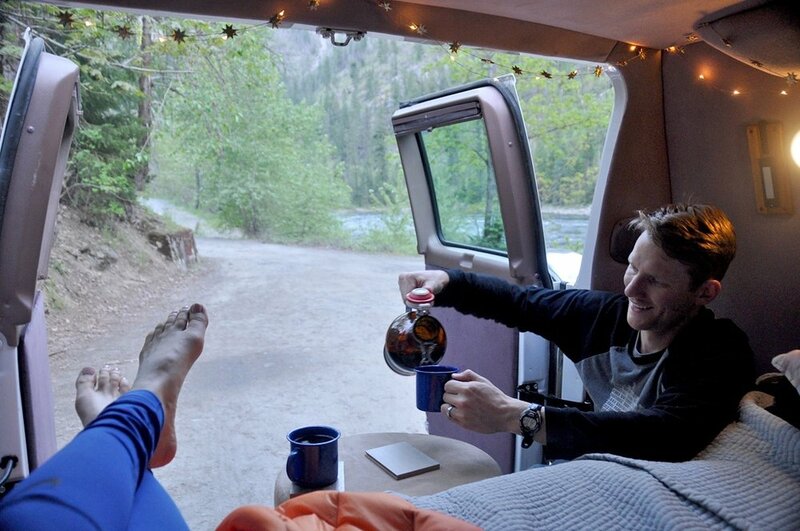 We have a whole article devoted to How to Shower while Living in a Campervan. It includes a video showing how we shower at a campsite (and no, it’s not that type of video!). We had no idea how much to expect for this expense. Many people told us how quickly propane can add us, so we were thinking our total cost would end up in the 3-digits. But we were pleasantly surprised by how reasonable our propane expenses were. We used our propane frequently (as we cooked most of our meals), but we tried to conserve as much as possible and were conscientious about not wasting too much. We typically would go through one 16 oz. tank per week. For the whole summer, the small propane tanks only cost us $28.71. If you are planning to live in a campervan or RV long term, we've heard that it's much more economical to fill up large propane tanks. But for a shorter road trip, the smaller cans make more sense. We kept two 2.5-gallon plastic jugs of water inside our campervan at all times. We filled these up at parks or campsites so that we would have water for drinking, cooking, brushing teeth and doing the dishes. A couple times throughout the summer the jugs would crack and we would have to replace them. But having these big containers of water was a huge money-saver compared to what it would cost to constantly fill them up at grocery stores or buy new water jugs all the time. Here it is... Our entire summer road trip budget tallied up into one neat table. Our 3-month road trip across the Western U.S. cost us a grand total of $7,671.95. And even though our daily expenses for two people came to $82.49, which is higher than our typical budget goal of $70 per day, we have no regrets. It was a summer of exploring new places, hiking, soaking in hot springs, eating s'mores around campfires, stargazing, trying new breweries, and spending magical nights in our campervan. During these 3 months, we had more adventures than we can count, so it was worth every single penny. How much did this road trip cost per person? This is a difficult question to answer since some of the expenses, like gas and campsite fees would be the same whether you're traveling solo or as a family of four. Remember that all the costs we have broken down are for TWO people. Use our budget as a guide, but know that it will vary depending on your situation. Want more? Check out our other travel budget breakdowns in Budget page. What do you think of our 3-month road trip budget breakdown? Do you want more details about any category? Please share in the comments below.